Introduce 21st-century skills like coding with the Robotics for Young Children Set. 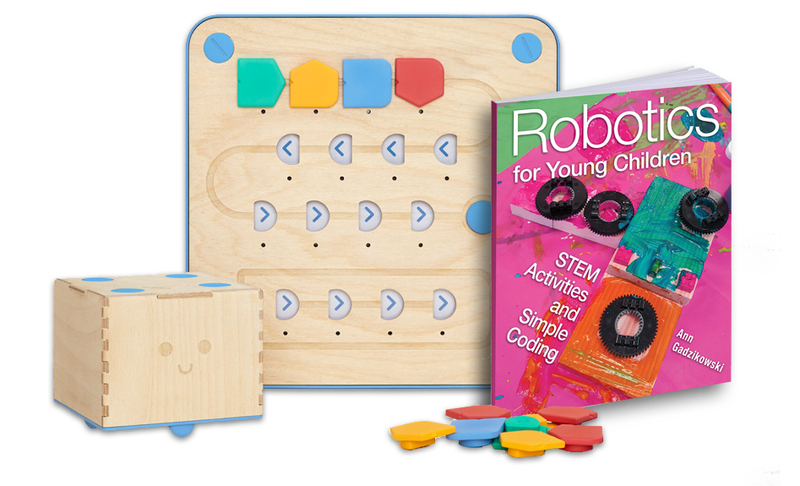 This set includes one copy of Robotics for Young Children and one Cubetto Playset Coding Robot. Introduce young children to the building and programming of robots through playful, developmentally appropriate activities. Many early childhood professionals are unfamiliar with computer science, robotics, and engineering concepts. This user-friendly and accessible book gives teachers great ideas for engaging young children with 100 exciting hands-on computer science and engineering activities. The book can be easily included in a developmentally appropriate curriculum and offers a balance of adult-facilitated and child-centered activities. "This book takes a solid, sensible, and low-geek approach to robotics for children. Within the educational narrative, the glory of the book is a suite of suggested activities, that benefit from an authenticity and creativity born of years of actual experience. It gives teachers the knowledge and confidence to stay afloat amidst a swarm of digital natives and cranky robots." Order your Robotics for Young Children Set today!